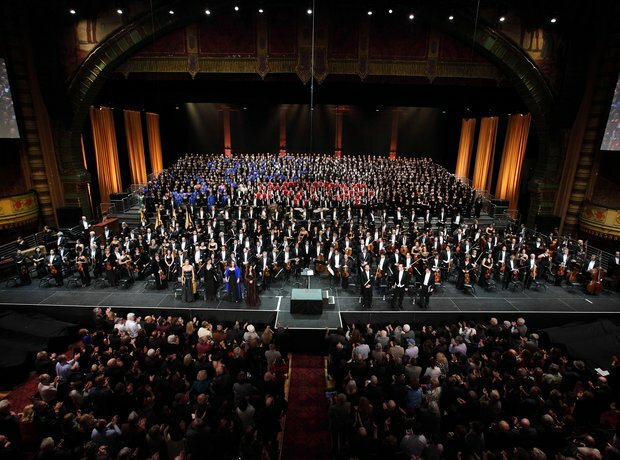 One of the highlight's of the LA Phillamonic year was the ambitious Mahler Project which saw Gustavo Dudamel conducting two orchestras through 11 Mahler works. The Mahler Project celebrated the 100th anniversary of the great composer with a series of concerts that spanned north and south America. Over the course of a few weeks Gustavo Dudamel led the LA Phil throughall of Mahler's completed symphonies as the Adagio of the Tenth and 'Songs of a Wayfarer' with two orchestras, the Los Angeles Philharmonic and the Simón Bolívar Symphony Orchestra of Venezuela. The concerts, which were performed at the Walt Disney Concert Hall in Los Angeles and Dudamel's home turf of Caracas, Venezuela, were also shown in cinemas. Los Angeles Philharmonic officials calculated that by the time Gustavo Dudamel finished the project, with the LA Phil and Simón Bolivar Symphony Orchestra, he will have conducted (largely from memory), more than 70 hours of Mahler in rehearsal and concert in less than a month. John Adams conducted the LA Phil in a performance that include the west coast premiere of Philip Glass' huge Symphony No. 9. THe performance also included Adams' own Violin Concerto which he wrote in 1993 and first performed by the LA Phil four years later. Baritone Thomas Hampson took part in the Mahler Project, appearing as a soloist on Mahler’s early 'Songs of a Wayfarer.' Hampson is a Mahler master; twenty-two years ago, he recorded a Mahler disc with Leonard Bernstein, himself a great Mahlerian, and in 2009, he recorded the 'Wayfarer' songs with Michael Tilson Thomas. Swedish soprano Miah Persson joined Hampson on stage for Mahler's Songs of a Wayfarer and Symphony No. 4 as part of the LA Phil's Mahler project. Leila Josefowicz delivered a magnificent virtuosic performance of John Adams’ Violin Concerto with the Los Angeles Philharmonic at Walt Disney Concert Hall in April. Estonian conductor Neeme Järvi conducted the first in a series of concerts as part of the Piatigorsky International Cello Festival featuring the Cello Concerto in B minor by Dvorák with soloist Ralph Kirshbaum, and the Symphony No. 5 in D minor by Shostakovich. Ralph Kirshbaum was one of the cellist who joined Neeme Järvi on stage on the evening, performing Dvořák's Cello Concerto. Legendary classical guitarist Pepe Romero gave a spellbinding performance of Joaquín Rodrigo’s Concierto de Aranjuez in his first performance at the Walt Disney Concert Hall in 20 years. Conductor Christoph König joined Pepe Romero on his Walt Disney Concert Hall debut as he led the Los Angeles Philharmonic in three performances. Also on the programme that night was Johannes Brahms’ Symphony No. 2, and Dvoák's Scherzo Capriccioso. The Los Angeles Philharmonic presented the world premiere of Richard Dubugnon’s 'Battlefield' Concerto for two pianos and double orchestra, written for Katia and Marielle Labèque. On the same bill, Semyon Bychkov conducted Rachmaninoff’s Symphonic Dances Walt Disney Concert Hall. Sir Simon Rattle returned to LA Phil for the first time in 12 years and led the orchestra through a glorious Bruckner's Symphony No. 9. The performance also included Ligeti’s Atmosphères, Wagner: Prelude to Act I of Lohengrin and Mahler’s Rückert-Lieder. Rattle's wife mezzo-soprano Magdalena Kozená made her LA Phil debut by singing Mahler's "Rückert-Lieder". As well as holding the post of Principal Conductor and Artistic Advisor of the Philharmonia Orchestra London, Esa-Pekka Salonen is the title of Conductor Laureate of the Los Angeles Philharmonic since 2009. Earlier this year he conducted the world premiere of the Shostakovich's forgotten unfinished satirical opera Orango. Renowned theatre, opera, and festival director Peter Sellars directed the Esa-Pekka Salonen conducted lost opera. Twenty-four-year-old Chinese pianist brought her unique blend of spontaneity and fearless imagination to the Walt Disney Concert Hall when she played Britten, Prokofiev and Dvorak conducted by James Conlon. James Conlon led the LA Phil through Britten's Sinfonia da Requiem, a piece originally written to commemorate 2,600th anniversary of the dynasty of emperor Hirohito.